Pansy Napangardi was born in Haasts Bluff [Central Western Desert], descending from a Warlpiri father from Baughan Springs and a Luritja mother from Illpili, Pansy illustrates various Dreamings from her heritage. 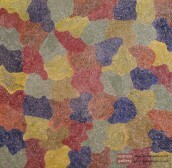 Whilst Pansy learnt her father’s Dreamings from artist Rennie Robinson which include Bush Banana, Water Snake, Marlu [Kangaroo], Cockatoo, Bush Mangoes and Willy Wagtail, her mother’s Dreamings were taught by her mother’s cousin and include Seven Sisters, Hail, Luritja Country, Desert Raisin and Kungkakutjara [Two Women]. Pansy recalls her grandparents story-telling her Dreamings and teaching her how to depict them by drawing in the sand. Thus, her childhood was abundant with artistic influence and cultural teachings. In the 1960’s Pansy moved to Papunya where she observed family and renowned artists such as Johnny Warangkula and Kaapa Tjampitjinpa creating Aboriginal masterpieces. At this stage, she began to experiment with paintings, practicing on paper and later progressing to collages which featured Ininti Seeds [traditionally used in ceremonial jewellery]. 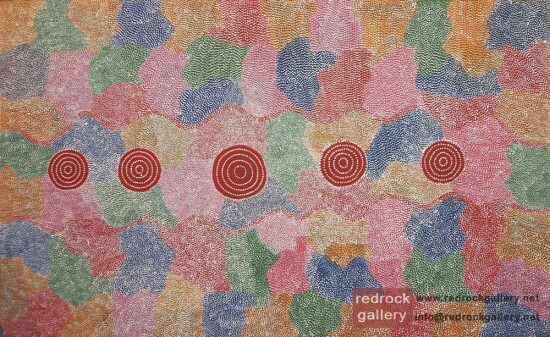 Unlike many female Aboriginal artists Pansy did not apprentice a male painter; rather she developed her own unique style independently. By the 1970’s she was working and selling her artworks in Alice Springs, later disengaging from this sphere and re-assumed her painting career in the early 1980’s. In 1983 Pansy commenced work with Papunya Tula Artists and by the late 1980’s had established herself as a leading female artist.